When you visit Yogyakarta, there is a family tourist attractions of interest to visit the Zoo Gembira Loka. Gembira Loka park is the only zoo owned by Yogyakarta. Gembira Loka Zoo are also classified in the category of museum zoologicum museum or a museum of wildlife. Gembira Loka in its history including the oldest museum in Yogyakarta after Sonobudoyo. 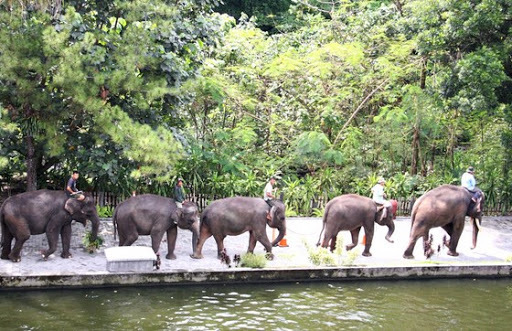 Construction of the zoo that was in the area Gajah Wong is the idea of ​​Sri Sultan Hamengkubuwono VIII in 1933. Sultan wished to have a folk entertainment in the form of botanical gardens (gardens rojo). Further thought he consulted with an architect of Austrian state named Kohler. A few years later the idea of ​​the establishment of the new zoo could direalisasiakan and then continued during the reign of the lane IX together Ir. Karsten. On 10 November 1953 the zoo was officially opened by Sri Sultan HB IX which in turn is managed by the Foundation chaired Gembira Loka Sri Paduka Paku Alam VIII. Over time, the development of the zoo is undergoing some changes of managers for managerial reasons. Although the journey have ups and downs, this zoo is still the mainstay attractions for Yogyakarta. According to data from the Department of Tourism DIY visitor numbers Gardens Gembira Loka the animals more than the number of visitors Sonobudoyo and Monument Jogja Kembali. However, the number of visitors in Gembira Loka be defeated by the number of visitors Yogyakarta Palace and Malioboro annually. In addition to displaying rare animals (mammals, reptiles, Aves, amphibians, Pisces) in the display in the form of iron barred cage or fenced walls or wood. Gembira Loka also has other interesting collections in the form of dry animal that has been preserved. The preserved animals that were placed in a special room that resembles a museum. The museum is located on the shores of an artificial lake in the zoo area Gembira Loka. Furthermore, along with the development zoo increasingly visited by many tourists, in 2007 built a natural laboratory Flora and Fauna as a learning tool for students and masysrakat especially children. In this place there are various collections as diverse as the collection of various types of insect and vertebrate and invertebrate animals. The zoo is already more than half a century old and is adorned by a series of verdant gardens with colorful flowers attractive. There are some big old trees that shade and add to the beauty of this place. Gembira Loka also has forested land that is allowed to grow and also land for persemaiannya. Most of these plants are not arranged neatly with the aim of presenting a natural atmosphere. Besides a close look at a variety of flora and fauna in this zoo, there are also various kinds of recreational vehicle such as genjot duck, elephant ride, camel ride, cave replicas are available to support tourism in Gembira Loka. Gembira Loka located at Jalan Kebun Raya 2 Kotagede, Yogyakarta. From the Bus Station to the zoo is about 4 km. Whereas if from Malioboro and the Sultan Palace is 6 km. To reach this place, tourists can use a variety of public transportation in Yogyakarta such as city buses, taxis, Trans Jogja buses, rickshaws and horse cart. When rickshaws and horse cart of choice, make sure you are not far from this place. If visitors use the city bus, choose line 9 or 7. Meanwhile, when using the Trans Jogja bus route 1B select. The bus will stop at this stretch dii stop adjacent to the zoo Gembira Loka.